The only reason I am relaying this information is as a warning – and perhaps some empathy - in case any of you find yourself in the FB hotseat. 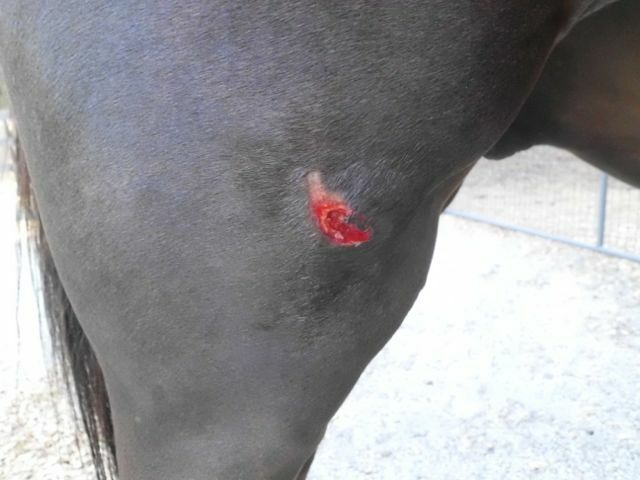 And then it showed this photo of Wrigley’s wound from yesterday’s blogpost. I had no idea that not only would no one click on the link and read the post… but they wouldn’t even read the entire title of the FB entry! Most people just looked at the pic, saw my first sentence and reacted – badly. 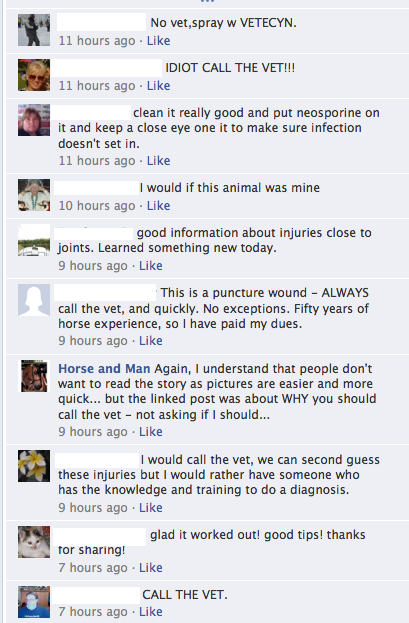 They thought I was posting a photo of my horse’s injury and seriously asking FB readers if I should call the vet or not. 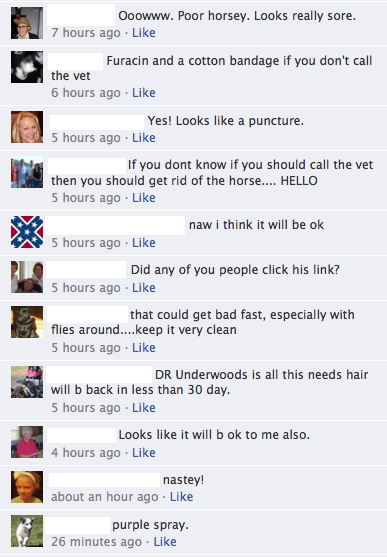 Understandably, many of the comments were not pleasant. But I wasn’t… except the way I wrote it and that photo made a large percentage of people get the wrong first impression. I even tried to defend myself as this was happening. 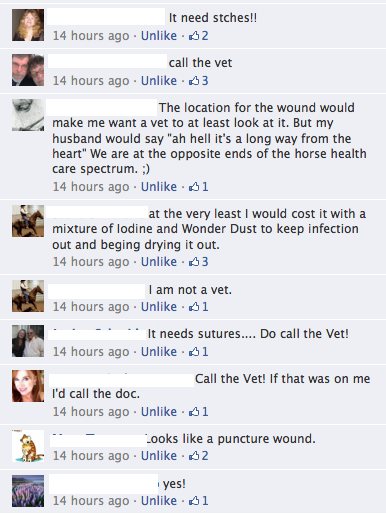 I wrote a few comments in the middle of all of the other comments saying that Wrigley was fine and that I did call the vet and ‘calling the vet’ was what the whole blog was about…! 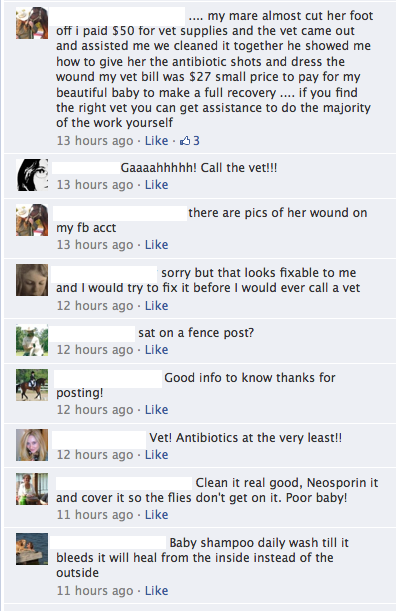 But, no one read those comments either – or very few did. 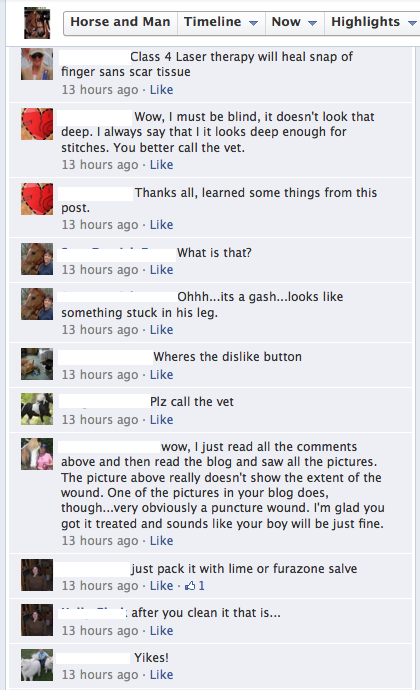 So, learn from my error and use FB carefully. Don’t mistake its power. It can do great good… and it can also skew information and spread that false info far and wide. 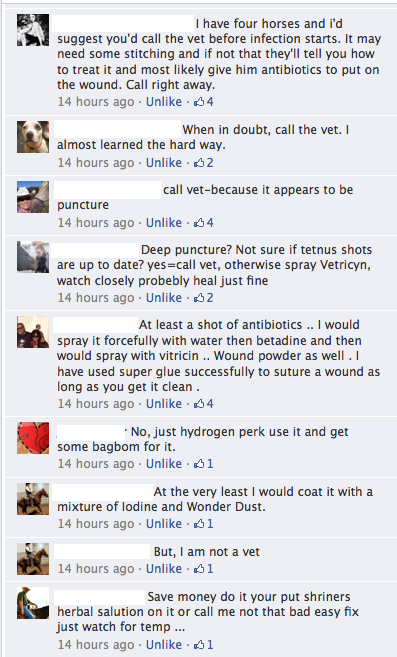 Here are the first several comments. You can see the pattern. Keep is simple, short and easy to understand on FB. FB is a GREAT communication device and it is a very useful venue – however – when speaking to the masses that only have time for glimpses, it is prudent to be very clearly written. The other piece I learned is that if people don’t think they know you, they can be really harsh. 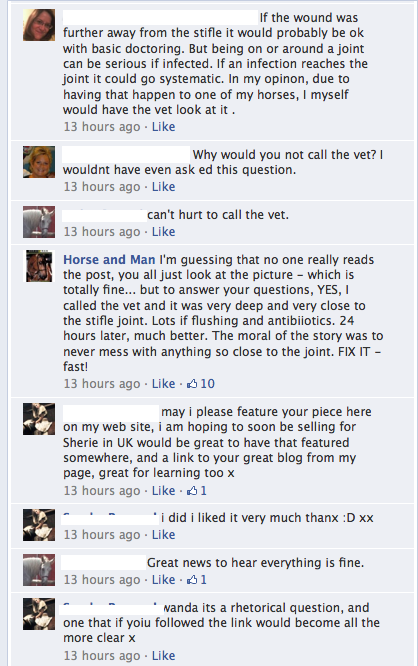 But, more often than not, especially with the Bucket Fund, I’ve seen it go the other way… the kindness of FaceBook strangers has touched the HORSE AND MAN blog very often and that makes me smile and forget the nasty of today! Speaking of tomorrow – a new Bucket Fund story is coming!